Do you want to bring the theatre to your home? Of course, you do. But for that, you need an amazing home audio system, and an amazing home system needs an equally, if not more, amazing subwoofer. But, why is a subwoofer so important? Because without a subwoofer your home stereo won’t be able to reproduce all the frequencies, and as a result, your listening experience will remain incomplete. Furthermore, with the addition of a subwoofer to your home stereo, you will be able to feel powerful movie sound effects such as roars of dragons and bomb explosions. But before you go and buy a subwoofer randomly, you need to make sure that the subwoofer you are going to buy is of top-notch quality. However, have no worry; I am going to help you in this regard. 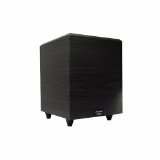 By writing a review on one of the finest subwoofers on the market- Acoustic Audio PSW-8 300 Watts 8-Inch Down-Firing Powered Subwoofer (Black). After you finishing my review, you can decide for yourself, whether this sub is good enough for you. Acoustic Audio, which is a well-known name for home audio enthusiasts, has extended on the success of their PSW series with the new powered subwoofers called PSW-8. This 8-inch down-firing powered subwoofer has got a sophisticated and sleek design, which makes it extremely pleasing to our eyes. You will find a plethora of interesting features in this subwoofer, such as an inbuilt amplifier, down-firing speaker, and internally based bass reflex enclosure. On top of that, this powerful subwoofer has 300 watts peak power and a frequency rate of 26 Hz-250 Hz. The sensitivity rate and impedance rate of the sub are 97db and 8-ohm respectively. Down-firing subwoofer means that the speaker is placed on the bottom of the enclosure. And thanks to the down-firing speaker, the bass gets distributed evenly in all the directions. However, this wooden down fire bass speaker does not come with a protective grill. Therefore, you have to be careful while unboxing the subwoofer, so that your fingers don’t puncture the woofer cone. A high rigidity PVA treated cone has been used in the subwoofer for a deep and accurate response. In addition, due to its long excursion, the risk of voice coil slipping out of the magnetic gap gets significantly reduced. The acoustic audio PSW-8 sub comes with an inbuilt digital drive amplifier which drives the sub to render clean, powerful and crisp bass sound. Moreover, this subwoofer relieves you of the duty of pushing buttons manually, as it includes an auto on/off switch. The RMS and maximum rate of this subwoofer are 150 and 300 watts respectively. A high RMS rate means that this subwoofer will be able to run on your desired level for a long period of time without damaging itself. Which means you can watch the whole season of game of thrones in one night without having to worry about blowing your amplifier. The PSW-8 subwoofer has a frequency rate of 26 Hz-250 Hz and crossover frequency of 40 – 140 Hz. This means the subwoofer can handle both movies and music effectively. Besides, the crossover frequency of the subwoofer is adjustable. The simple yet elegant black ash wood finish gives the sub a refined look. Therefore, unlike some of the other subwoofer, this one will be an impressive addition to any home decor. This subwoofer encompasses a ported cabinet, which is braced internally coupled with gray batting to make sure that the subwoofer remains firm and steady at high volume levels. They are engineered in a way that will allow the subwoofer to produce low-frequency sounds without any kind of distortion and remove resonances. You Can choice any size according to your requirements, There are 5 sizes (6.5-inch, 8-inch, 10-inch, 12-inch, 15-inch) available. 1. Does this subwoofer include a three-prong power plug that contains a ground connection? No, it’s just 2 pronged polarized power plug and has no ground connection. 2. I wanted to hook this up to the aux output of my stereo, but I am not getting any sound. Should I use the speaker input instead? Answer: You should be able to use both. Check the manual for more information. 3. Can it just be plugged into the wall, or do I need to buy a receiver? This is only a subwoofer speaker; therefore, you need to buy the receiver. 4. Could you tell me how long the power cord is? The power cord is around 6 feet long. 5. Will I be able to connect it to a DJ mixer for home purpose? Technically, you can. But you need to remember that it is not a full range speaker and will only produce low-frequency sounds. So, I wouldn’t recommend it. 6. Where does it get made? It is designed and manufactured in America. 7. Need to buy a receiver for setup or just need to put the plug in wall? You will need a receiver. Acoustic audio PSW-8 300 Watt 8-inch down-firing powered subwoofer has all the features that you would want in a subwoofer and will certainly be a fantastic addition to any home audio system.